It&apos;s been 20 years since the Rwandan genocide, but for the Canadian soldiers who were there as part of a doomed UN peacekeeping mission, the sights, sounds and smells have not faded from memory. “There was an overpowering stench of death,” said Major Brent Beardsley, who served alongside General Romeo Dallaire (both are now retired). Rwanda was a country of seven million people in 1994, 85 per cent of them Hutu. Extremists within the Hutu ethnic group had been inflaming cultural tensions for years, blaming the Tutsi minority for economic and social problems. On April 6 the plane carrying President Juvenal Habyarimana (a Hutu) was shot down. His death sparked a wave of horrific violence in which more than 800,000 people, mostly Tutsi civilians, were massacred. ​An estimated quarter of Rwandans continue to suffer the psychological effects of the genocide, a legacy that is also felt far beyond the country’s borders. 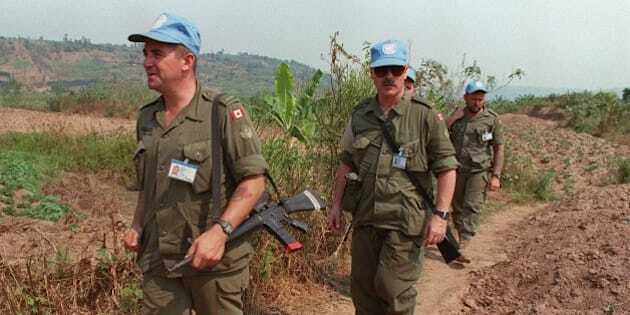 ​For several of the 13 Canadians who were part of the United Nations Assistance Mission for Rwanda, UNAMIR, in April 1994, the memories are intertwined with continuing symptoms of Post Traumatic Stress Disorder (PTSD). In Beardsley’s case, he developed symptoms in 2000 while working at a military support training centre, six years after returning home. It was triggered by the courses he was giving — the kind of training he never got before going into Rwanda. The scenarios became a little too realistic to bear. He found he started having trouble concentrating, trouble sleeping and he became moody. "Eventually one day I just got up and I couldn’t put my boots on,” he said. “I reached down to put on my boots and I just couldn’t do it anymore." His willingness to be treated and his religious faith helped him get back to work part-time six months later. But it was years before he was able to return to work full time, and even then it was with some restrictions. Today, he recognizes his triggers - things such as strong body odour, bloody meat or big crowds - and avoids them. In 1994, Dallaire warned UN headquarters about the ethnic trouble brewing in Rwanda. He urged action. He pleaded for backup. But he found his small UN force abandoned by the world’s superpowers, unable to stop the killings, unable to protect so many Rwandans -- though the force did maintain some safe shelters. Dallaire was not available for an interview, but others who were with him describe the nightmare they lived through. ​“In Rwanda you never really knew who would come after you, which side,” said retired Captain Jean-Yves St-Denis, 54, of Calgary. He specialized in logistics and supply chain management — a particular challenge in Rwanda. He was diagnosed with PTSD in 1997. “There was no line in the sand. I was always wondering, ‘who should I watch?’"
​St-Denis lives with his PTSD to this day, and is especially conscious of it in new environments. He went to Rwanda in late April and had an early idea of how bad the situation was going to be. But the intensity took him by surprise when he arrived and saw dead bodies within 10 minutes of landing at the airport. That’s a smell that he can recall to this day, a smell that can make him physically sick. He likens the symptoms to a cold. When it comes on he takes medication, talks to his doctor and tries to get over it. Not everyone can get over it, though. Major Luc Racine, another Canadian serving with Dallaire, suffered from PTSD for years. He killed himself, in Mali, in September 2008. ​Dallaire spoke very highly of Racine before the Senate in 2009, saying he, “was one of the 12 reinforcements who came to me in 1994 and, within the span of 42 hours, had saved an orphanage full of children … Major Racine subsequently took command of a small battalion of unequipped Canadians and took over the humanitarian protection zone, which had within it 1.6 million internal refugees. He coordinated the humanitarian protection, support and, ultimately, the transfer to the Rwandan government." ​“Major Luc Racine is a veteran and he is one of my heroes,” Dallaire added. Retired Major Jean Guy Plante, 71, of Saint Bruno, was the media spokesperson for the mission. Somehow he managed to escape PTSD. However, he also mentions some moments of great generosity and beauty, such as the day he was out with media and he noticed an old woman who looked very hot and parched. He risked getting out of his vehicle to take her some water. The woman accepted it, but then turned and handed it to a younger woman who had a baby strapped to her back. “I also saw some of the best acts of love that I have seen in my life,” said Plante. Canadian soldiers who served under Dallaire in Rwanda will meet in Ottawa Monday to mark the anniversary together. Jean-Yves St-Denis will be there.